Many Manitobans will be surprised to learn there is a stained glass window in a church in Vancouver, British Columbia, which includes in its design the Manitoba coat of arms and scenes from Manitoba's history. 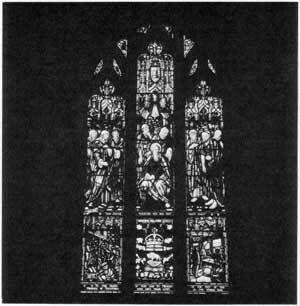 The story of this unique window really begins in World War One, with the Reverend (Lieutenant Colonel) George Fallis, a Methodist minister who served as a chaplain with the Canadian Expeditionary Force from 1915 until the war's end in 1918. In his autobiography A Padre's Pilgrimage (Ryerson Press, Toronto, 1953) he tells how one evening in 1918, after burying fifty-four victims of an air raid on a Canadian hospital in France, he vowed that if he was spared he would return to Canada and build a chapel in memory of all the Canadians who had given their lives in the war. In May of 1920 Col. Fallis came to Vancouver to serve a congregation already planning to build a new church along the very lines that he envisioned. Plans quickly took shape for the first project, the Memorial Hall, which was completed in February, 1923. In 1925 a competition was held for the design of the major project, to be known as Canadian Memorial Chapel. Fourteen architects competed, with the award being given to R. P. Twizell of the firm of Twizell and Twizell. Specifications called for ten stained glass windows, one for each of the then nine provinces and the Yukon Territory, also a Chancel window and an All-Canada window. Each of the ten provincial windows was to have a religious motif with the provincial coat of arms directly underneath, flanked on either side by historical events of the province concerned. Col. Fallis chose the themes and the Biblical passages for the windows; their design and preparation entrusted to the Robert McCausland Company of Toronto. The corner stone was laid September 17, 1927. On November 9, 1928 the chapel was dedicated and regular Sunday services began November 11, 1928, exactly ten years after the Armistice of 1918. Col. Fallis travelled from coast to coast in Canada to solicit funds for the memorial windows. "Possibly nowhere in Canada was I met with more enthusiasm for Canadian Memorial Chapel than in Winnipeg," he wrote. After visiting that city for only a few days he had obtained pledges to cover the cost of the Manitoba window in full. "To the Glory of God and In Memory of the men of the Province of Manitoba who gave their lives in the World War." "La Verendrye Builds Fort Rouge 1738"
"Trial of Thomas Scott by Louis Riel 1870"
The historical scenes appear to have been selected for their general interest and not because of any relationship to the themes of the windows. Three scenes from other windows are also of particular interest to Manitobans, and could have quite properly been included in the Manitoba window. "An Indian Buffalo Hunt," depicted in one of the panels in the Saskatchewan window, and, in the Alberta window, the "Great March of the Northwest Mounted Police, 1874" and the "Arrival of Sir George Simpson at a Hudson's Bay Company Fort, 1835." "This window is erected in honour of all men and women of Canada who rendered service in the World War"
Manitoba is represented here by a panel depicting the founding of Upper Fort Garry. In case the impression is left that Canadian Memorial Church (as it is known today) is nothing more than a monument in stone and stained glass to a war fought half a century ago, it should be mentioned that the building serves a large and active congregation, most of whose members are well acquainted with and proud of their church's heritage. Although affiliated with the United Church of Canada, there is little emphasis on denominational practices, in keeping with Col. Fallis' desire to have the building stand as a memorial to all Canadians.